A group of FMAs and volunteers from Cambodia and Myanmar, led by the CMY Provincial, Sr. Jessica Salvaña, joined this year’s celebration of the Institute’s Day of Gratitude held in Thailand last April 26. Gathered around Mother Yvonne Reungoat, (the FMA Superior General) the CMY delegation joined the Provincials and other representatives of the Interprovincial Conference of Asia-Oceania (CIAO), the FMA communities of Thailand and their Educating Communities, Bishops, priests, and members of the Salesian Family from all over Thailand. It was a joyful Salesian event enriched by the typical warmth and graciousness of Thai hospitality, the fusion of cultures, the creativity and enthusiasm of both young and adults, and the delicate attentiveness of the Thai Sisters, their past pupils and lay collaborators. Indeed, everyone tried to be a sign of hope and joy! The symbol of this year’s feast of Gratitude -- the Thai hand garland made of fragrant jasmine interwoven with other colorful flowers -- indeed spoke of the diversity in the Institute, united by the merciful love of God. 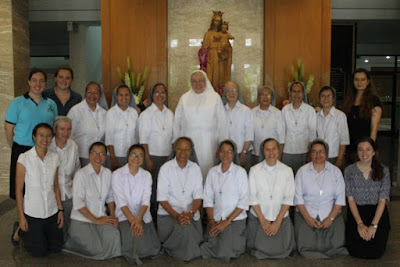 The CMY group included Sr. Lina Chiandotto, the former Superior of the one-time pre-province “Maria Nostro Aiuto” (Mary Our Help), which gave birth to the present CMY Province, and also the Sisters who served and belonged to the Province of Thailand in the early years of their mission: Sr. Thippawan Teresa Pharksuwan, Sr. Ma Yee Filomena, Sr. Lakana Yawasang, Sr. Teresita Garcia, Sr. Maria Elena Estacio and Sr. Teresa Tuale. Other FMAs from CMY who joined the celebration were Sr. Rosa Lyne from Myanmar, Sr. Giovanna Penello, Sr. Maria Thao, Sr. Ophrini Elizabeth Lohrii, Sr. Amanda Alvarado Lopez and Sr. Eng Sarin from Cambodia. The volunteers were Clare Pressimone, Colleen Quigley, Charlene Chua, Cara Weidinger and Monika Svigelj. The group also had the chance to meet the Papal Nuncio, Archbishop Paul Tschang In-Nam and the Cardinal of Bangkok, who with other ecclesiastic authorities, graced the occasion. In addition, the Sisters and volunteers who arrived earlier, had the chance to go on a pilgrimage to near-by churches and do a little sight-seeing arranged for them by Sr. Lakana.